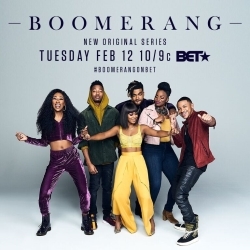 Actress, Recording Artist, Professional Ice Skater, and Dancer, Tetona Jackson gets ready for the role in the February 2019 show “Boomerang”, BET’s television series that acts as a sequel to the 1992 film of the same name which starred Halle Berry and Eddie Murphy. The new series picks up roughly 25 years later with Tetona Jackson playing the character of Simone as she tries to step out of her parents’ shadows and make a legacy of their own. Her parents are played by Halle Berry and Eddie Murphy respectively in the film. The series will follow a group of childhood friends as adults who are looking to make their own mark as marketing professionals while navigating their feelings for each other. As an actress on the silver and small screen, Tetona has also starred in MAXIMUM RIDE, from the bestselling James Patterson literary series of the same name, STOLEN FROM SUBIRBIA, DEAR DIARY I DIED, the 2017 horror film SEVERED ROAD. Recently, Tetona also starred as a series regular on the Hulu x AwesomenessTV series “All Night”. Portraying the young and spunky character Cassie, Tetona Jackson took on the role as the young lesbian who is holding her romantic relationship with another character a secret. Tetona is not only happy to be part of the youthful comedy but is happy to have been able to portray an LGBT character which an interesting character arc. Tetona celebrated the end of 2018 with the release of the film ALL STYLES. Portraying the character “Lark”, Tetona Jackson took on the role of a ballerina, who uses her skills to participate in a recently formed dance crew competing against a rival dance crew in a major competition. The film also stars Du-Shaunt “Fik-Shun” Stegall (the Season 10 winner from “So You Think You Can Dance”) as he leads a dynamic and multi-talented ensemble cast of Keon Motakhaveri (“13 Reasons Why”), Heather Morris (Fox’s “Glee”), Erica Klein (“Without the Lights”), Hokuto Konishi (HONEY 2), Raymond “Nasty Ray” Mora (STEP UP 3D), James Moses Black (“24: Legacy”). Fans of Tetona can keep up to date with all her projects via Instagram and Twitter. Renee Schumer and 4 others upvoted this.